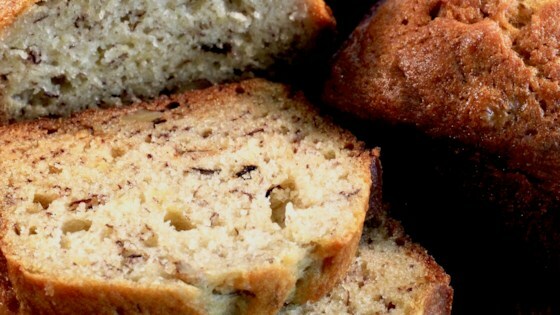 "A wonderful banana bread that is lower in fat and calories than most other banana bread recipes." In a medium bowl, beat the white sugar and margarine or butter until smooth and creamy. Beat in the eggs, water and bananas with the sugar mixture until it is well blended. Mix in the flour, baking soda, salt and baking powder just until the mixture is moistened. Be sure to scrape the sides of the bowl to blend all ingredients. Bake at 350 degrees F (175 degree C) for about 60 minutes. Bread is done when the top is firm to the touch and a golden brown color. Time will vary according to loaf size and oven type. When bread is removed from oven, allow it to cool on it's side for 10 minutes, then remove from pan and let cool on a rack. This bread is also excellent if you add mini chocolate chips or small fruit pieces to the mix just before baking.